The dust has finally settled on the 2018 FIFA World Cup. At home, millions cheered on Gareth Southgate’s young, unheralded bunch of England players who went further than many expected. In the end, France cruised past Croatia to take home their second ever World Cup. To most, the tournament is a source of diversion and entertainment, full of joy, passion and frustration. To others, it’s a source of profit and returns. The World Cup is fertile ground for investment. The prospect of gain is undeniable, the only question is how to participate in it. From those betting on the matches and the opposing bookmakers, the pubs, the advertisers , the sponsors, ticket vendors, merchandisers, and last but not least the organisers, the ‘Fédération Internationale de Football Association’ (FIFA) and its members. As investment professionals, we cannot help but draw comparisons between these groups and the different participants in the financial industry. The parallels are especially apparent within one of the most hotly debated topics in finance, Active verses Passive fund management. Consider those who ‘actively’ place bets on which team will win each World Cup match. It often involves researching the players, team statistics and where the best odds can be found. Nobody is going to call it correctly every time, but the best, or luckiest, can correctly pick the winners most of the time. Whoever picks the most winners correctly is going to make the most money. The outcome of who wins each match, and which team ultimately wins the tournament, affects how good their returns are. An actively managed fund is one where the fund manager picks their preferred stocks. As with betting on the games, the manager who picks the most ‘winning’ stocks will achieve the highest returns. On the other hand, passively managed funds – often called “tracker” funds – try to replicate the performance of a particular market as closely as possible. It’s like owning shares in FIFA or the World Cup itself (hypothetically). The outcome of each game is not important and you don’t need to research every aspect of the tournament. All that matters is that people buy tickets, merchandise and watch the matches. As long as football as a sport proves popular, you would hope to get a positive return on your investment. As you’d expect, active funds require more people to research and carry out transactions, making the cost of investing higher than a passively managed fund. An active fund typically charges around 1% whereas a passive fund can be as low as 0.04%. This difference puts the active funds at an immediate disadvantage as they have to beat the passive funds’ returns by more than the cost of their fees. Tracker funds have been gaining in popularity over the last decade. In the current post-financial crisis bull market, low cost funds simply tracking the market upwards have tended do well. However, when markets slow, tracker funds – by design – will follow. And this is where actively managed funds have the advantage. Being able to adjust their portfolios allows them to be cautious in downturns, and bullish in upswings. If they have positioned the fund correctly, their stocks can outperform the market. Passive funds, if they work as designed, should never beat their markets, whereas an active fund’s aim is to outperform. It’s not surprising then that the highest returning funds are likely to be actively managed. It’s also no more surprising that the worst performing funds are likely to be from active managers whose bets haven’t paid off. From this we can conclude that a lucky manager might outperform over the short term, but a genuinely good manager should have consistently strong returns relative to their peers. Picking the right active fund is therefore hugely important. Today, the active versus passive argument is still fiercely debated and notably divisive. Many investment managers will choose their side and never waiver. A common view often shared in the financial press is that active funds should be abandoned because fewer active managers are beating passive funds every year. We believe that it depends entirely on the market the fund is investing in. Below we have compared the returns of active and passive funds across US large cap equities (Figure 1) and Emerging Market equities (Figure 2) over the last 10 years. Each shade of red and green represents 25% of funds invested in each asset class. In both cases the active funds have a much wider spread of returns, including having both the best and worst returns in each market, as explained above. 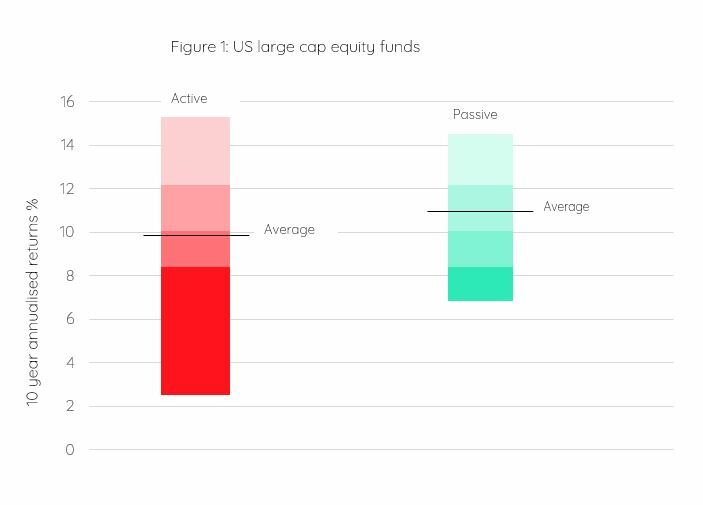 The data shows us that in large, transparent, heavily regulated markets, such as the US (and the UK), active managers struggle to beat passive funds, on average. In these efficient markets, the same information on traded companies is readily available to analysts from thousands of investment firms as well as private investors. It follows that on such a level playing field it is difficult for an active manager to continually beat the market. Over 10 years, a high number of US passives are in the top quartile (25%) of all fund returns. Passive investors therefore still have a good chance of picking a top-performing fund. But for Emerging Markets it’s clearly a different story. The theory is that Emerging Markets economies tend to be less efficient owing to the fact that they are geographically spread out, offer less robust regulatory frameworks, and have far fewer analysts scrutinising company reports. A good active Emerging Markets manager, with access to the right information should therefore have a better chance of getting an edge on the competition, and beating the market. Figure 2 shows that the average active fund outperforms the average passive fund in Emerging Markets by 3% cumulatively over 10 years. It also shows that the best returns from active funds are far superior to passive funds. The potential gain through good fund selection is far greater with active funds compared to passive. 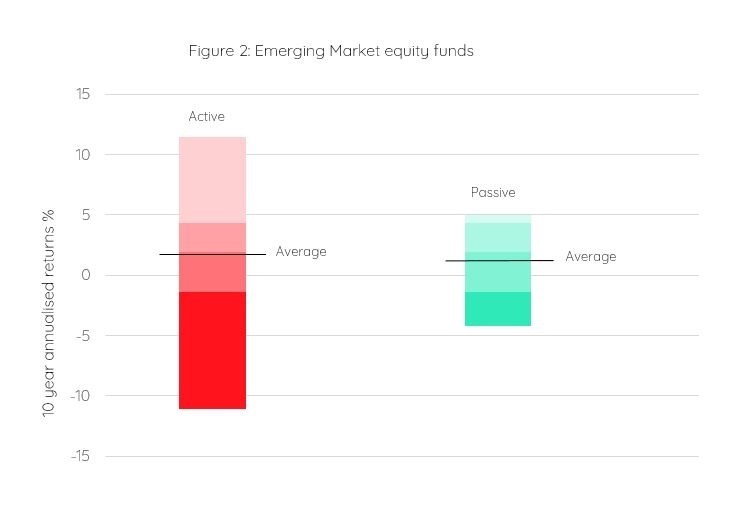 However even if you were to pick one active and one passive Emerging Markets fund randomly, the chances are your active fund will perform better. While the data continues to support it, our view is that it is worthwhile investing actively in Emerging Market equities. The next challenge for us is how to select the right manager. To show the importance of good manager selection, we will take our own portfolios as an example. 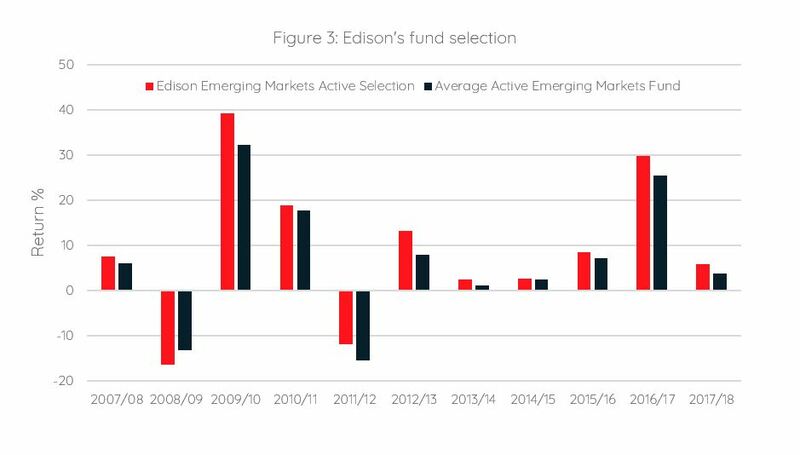 Figure 3 below compares Edison’s selection of active Emerging Market managers versus the average active fund. We’re pleased to have successfully chosen better-than-average active managers in every year since our inception bar one. It’s resulted in a cumulative EM return of 156% for Edison, versus the average active return of 107% over 12 years*. The Edison investment strategy performance figures are based on simulated portfolios which are constructed from the asset allocation and investment manager analysis and research performed by Edison Wealth Management to manage client portfolios at the relevant time. The average cautious, balanced and adventurous fund performance is the average return achieved by funds listed in Morningstar’s GBP Cautious Allocation, GBP Moderate Allocation and GBP Aggressive Allocation categories. The above charts are for illustrative purposes only. Where referred to, US large cap equities and Emerging Market equities are represented by their corresponding Morningstar categories: ‘US Large Cap’ and ‘Emerging Market Equity’, respectively. Figures 1 & 2 show 10 year returns to 30/06/2018. Figure 3 compares returns across discrete 12 month periods between 01/07/2007 and 30/06/2018. All returns are in sterling terms.